Going back to all them years ago when I started Street Phire (2001) I used to write articles about whatever interested me, what was going on around the doors, in the scene, what events were happening and what I was doing at Uni and tech crap.. Some years later and I find myself writing a technical post about nothing to do with BMX but to do with one of my other loves and that is Street Fighter, the game i’ve been playing since about 1994 and they just brought out the latest version, Street Fighter V released earlier this year. Capcom announced back in February 2016 that they’d be releasing SFV on PS4 and PC platforms only, totally kissing goodbye to the Xbox players but releasing cross platform gaming which for me was a first in a long time! I’m sure they’ve done this type of thing before with other games but in the past PS and Xbox and PC people had only the option of playing against people of the same platform so this would make it a lot more interesting. 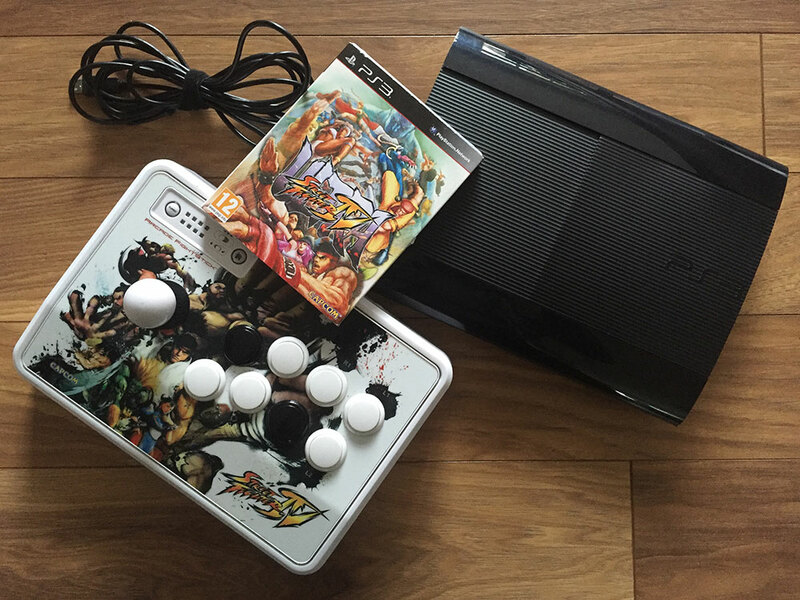 My last setup for playing SFIV was a PS3 with Mad Catz SE Fightstick which i’d bought the stick while out riding with the guys in Gateshead in an eBay fuelled bidding war but I won and this would be the beginning of me taking Street Fighter to a whole new level.. Roll on a couple of months and Olly Olsen bought himself a fight stick too and he and I started playing every Sunday after being out on the bikes up in his loft setup Olly had so awesomely made, a man cave of gaming, hi-fi equipment and BMX DVDs.. perfect! Anyway roll on to the current past couple of weeks and I setup a new PC courtesy of my friend Callum who helped me build a decent spec machine capable of smashing out SFV and a few other classic titles. I was that out the loop and had been playing consoles the past decade that I wouldn’t of had a clue what to get apart from what the Capcom website advised. Now you may be thinking at this point why didn’t I just buy a PS4? Already built, small footprint, perfect for the job.. yeah you’re right but I used to like playing games like Call of Duty, Command and Conquer, Unreal Tournament and I’ve got a itch to want to play some new games too and most of them play best on a mouse and keyboard setup far better than on a flipping PS control pad. This probably stems from my original years smashing out many a late night on the old PC hoping for a minimum of 25FPS spending endless hours overclocking every bit of the machine to get them extra few frames. Anyways that was that, the PC was built and after 10 hours of fannying on Callum and I had built a decent setup ready for the Steam network download of Street Fighter V.
Now either being a tight arse or just loving the Mad Catz Fightstick I’d invested so heavily in I kind of wanted to keep using it and thought to myself “yeah it’s USB, any PC should be able to recognise that or at least you should be able to get a driver for that to work..” yeah right. This would be the first of many days research trying to figure out why a relatively modern PC build with Windows 10 that could see the Fightstick wouldn’t actually let me play with it.. this was very confusing but read on for the solution! I’d been reading the various forums out there about Playstation controllers getting to work on your PC, Mad Catz Fightstick compatibility issues and how Xbox controllers worked pretty much without a problem but I was almost near the end of my tether with my PS3 Mad Catz stick cause for the love of everything it just wouldn’t work. It was something to do with chipset that was on board my Motherboard being a non VIA chipset and that basically meant the machine would detect but not communicate properly with the fightstick. The solution was to go out there and buy a USB PCI Express Card with a VIA Chipset and install that and hope for the best. 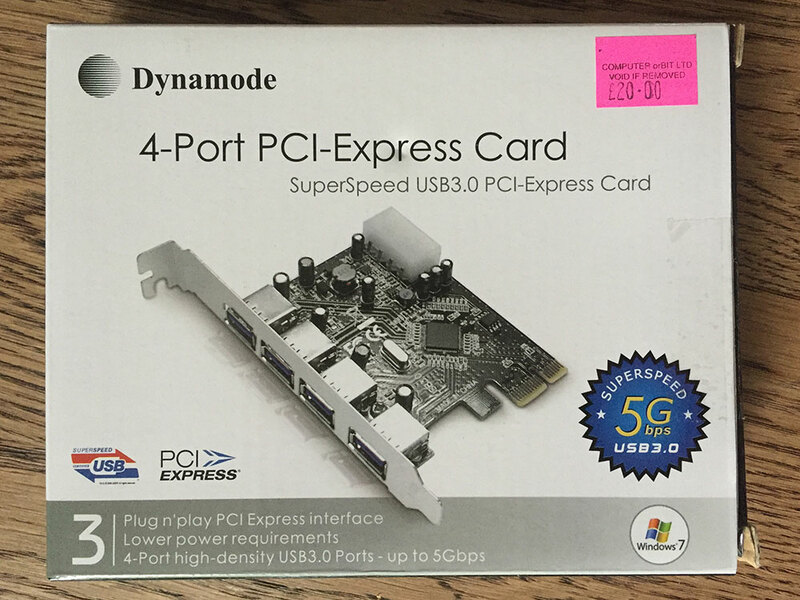 I went to my local computer store (Computer Orbit) and bought the Dyanmode 4-Port PCI-Express Card with VIA Technologies VL800 CMOS Chipset which set me back £20. I installed the USB 3.0 Card into the machine, tried plugging in my mouse as a test with no luck at all so then went to put the CD of drivers it came with into the DVD drive and pretty much threw it away after about 10 minutes of trying to install the drivers because believe it or not they are useless and Windows 10 wouldn’t let me install them as it reckoned there was no such device installed… So I went on the net and googled the following “via VL800 drivers” which lead me to the VIA downloads website EOL (End of Line) section. 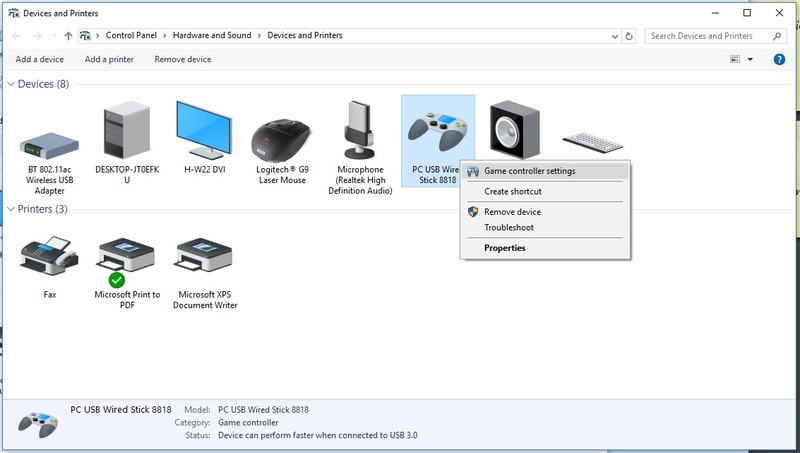 Scroll to the bottom of the page and downloaded the latest version of the drivers and then after a quick run of the old exe the USB ports started to recognised things that were getting plugged in. 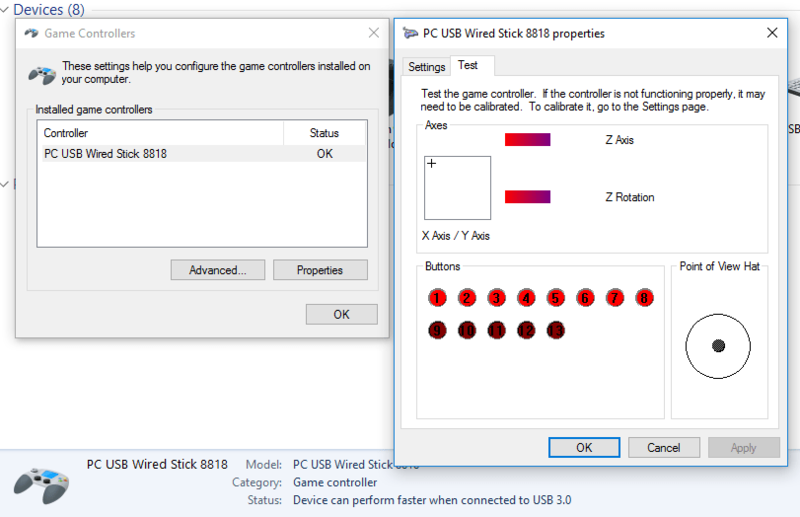 Next I hit up the Devices and Printers section of Windows 10 to see if it was reading the Fightstick and there it was, same as before, displaying the “PC USB Wired Stick 8818” but this time when I right clicked on it and selected “Game Controller Settings” and hit “Properties” it read the inputs from the Fight Stick!!! 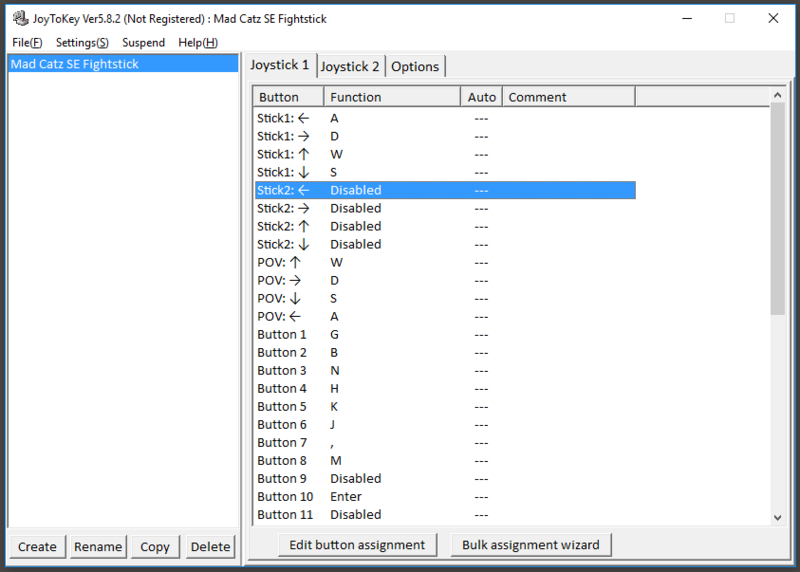 Massive leap forward, now it was time to get a nifty little program for free called JoyToKey that allows you to map keyboard buttons to the stick via the app thus allowing you to play with the stick within SFV. All you need is this handy guide below which tells you what buttons do what within SFV and you will be up and running within minutes. Once you have this all sorted you can launch the game, check the controller settings and make sure all the buttons are set how you want them before the big fight. Now hopefully this will work for you as well as it has for me but without the “knocking your head against a wall bit” for a couple of days reading forum post after forum post and terribly recorded videos. I’ve done my best to explain this as easily as possible and if you give it a try you’ll be able to get your PS3 Mad Catz SE Fightstick up and running withing 30 minutes. And after all this crap if you don’t want to build or have a PC already and you do have a PS4 then Mad Catz made a legacy controller update for the PS4 that allowed you to use your PS3 fightstick within the game.. double bonus!! Right it’s time to get back on with the fight, if you fancy a bit of Street Fighter against Olly or myself then look for teamNSF and HMANNSF.. enjoy the game!